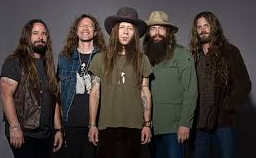 Blackberry Smoke have partnered with Children’s Healthcare of Atlanta to raise money and awareness for the Aflac Cancer and Blood Disorders Center in support of Childhood Cancer Awareness Month. Throughout September, the Atlanta group will spearhead several fundraising initiatives, including auctions for four different autographed guitars. The band will also host several VIP Meet & Greets in addition to several other events that will be announced later this month. The band has created a special donation page where friends and fans can contribute to the cause and learn more about the organization here. To kick off Childhood Cancer Awareness Month, the band recently spent a day at CHOA, visiting patients’ rooms, delivering gifts and performing for patients, family and staff. They also presented the hospital with a check for $50,000.